Abstract. In the framework of developing a global modeling system which can facilitate modeling studies on Arctic Ocean and high- to midlatitude linkage, we evaluate the Arctic Ocean simulated by the multi-resolution Finite Element Sea ice-Ocean Model (FESOM). 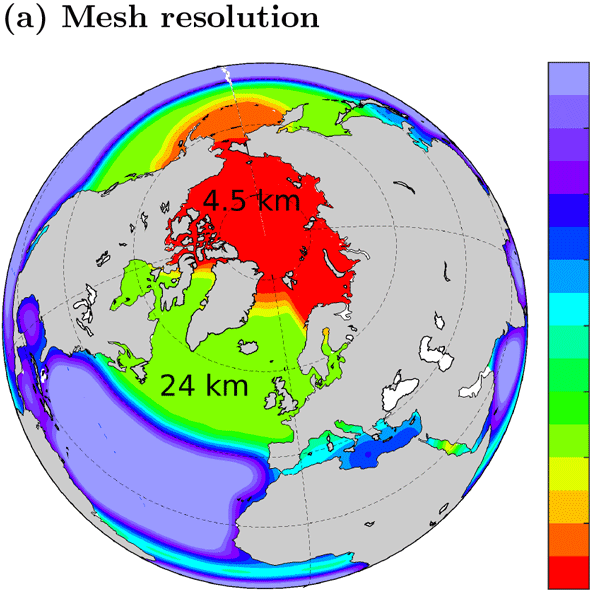 To explore the value of using high horizontal resolution for Arctic Ocean modeling, we use two global meshes differing in the horizontal resolution only in the Arctic Ocean (24 km vs. 4.5 km). 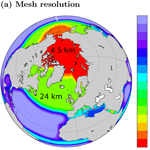 The high resolution significantly improves the model's representation of the Arctic Ocean. The most pronounced improvement is in the Arctic intermediate layer, in terms of both Atlantic Water (AW) mean state and variability. The deepening and thickening bias of the AW layer, a common issue found in coarse-resolution simulations, is significantly alleviated by using higher resolution. The topographic steering of the AW is stronger and the seasonal and interannual temperature variability along the ocean bottom topography is enhanced in the high-resolution simulation. The high resolution also improves the ocean surface circulation, mainly through a better representation of the narrow straits in the Canadian Arctic Archipelago (CAA). The representation of CAA throughflow not only influences the release of water masses through the other gateways but also the circulation pathways inside the Arctic Ocean. However, the mean state and variability of Arctic freshwater content and the variability of freshwater transport through the Arctic gateways appear not to be very sensitive to the increase in resolution employed here. By highlighting the issues that are independent of model resolution, we address that other efforts including the improvement of parameterizations are still required. How to cite: Wang, Q., Wekerle, C., Danilov, S., Wang, X., and Jung, T.: A 4.5 km resolution Arctic Ocean simulation with the global multi-resolution model FESOM 1.4, Geosci. Model Dev., 11, 1229-1255, https://doi.org/10.5194/gmd-11-1229-2018, 2018.